Dragon’s Crown Original Soundtrack is the soundtrack for the Playstation 3 and Vita game, composed entirely by Hitoshi Sakimoto. Finally released two years after the game, the soundtrack contains three discs worth of material, including two bonus piano solo arrangements. While the game features a western medieval setting, Sakimoto chooses instead to bring in Middle Eastern influences and instruments (most notable in the percussion and melodies) in addition to his own unique voice and orchestral stylings. The combination of the two works quite well, and Sakimoto’s subversion of some of the more common scoring decisions for the setting makes both the game and the score all the more memorable. 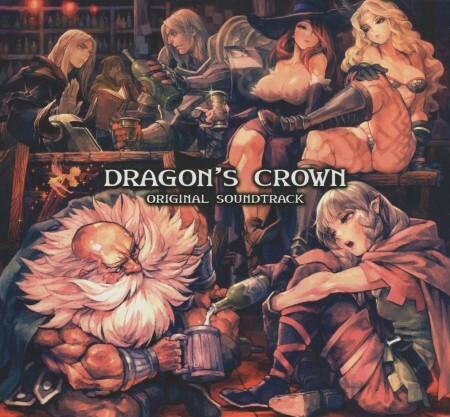 The soundtrack begins appropriately with “Dragon’s Crown”, establishing the general atmosphere of the album. 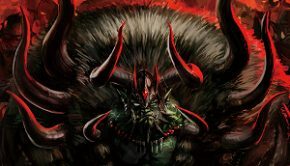 The track is fairly short, but it introduces the heavier percussion work, the Middle Eastern touches in the composition, flashes of some common motifs, and the general epic orchestral feel that pervades the rest of the soundtrack. “Title Theme” is also an important early track, again previewing some of the recurring motifs and textures that are to be encountered later on, but in a more subdued atmosphere. Neither track in itself is as noteworthy as what is to come, but they set the stage nicely. The largest portion of the track is made up of stage tracks, each accompanying a different area and coming in two versions for the A and B routes. The two versions often share some musical ideas, and even entire segments. The tracks are fairly varied and contain many distinct setions over their runtimes, not being constrained to a single idea. This does often mean there is less development for each idea, but things stay interesting and unpredictable throughout. “Ancient Temple Ruins” is a great early multi-layered track that captures not only the beauty and wonder that comes with the start of a journey, but also the solemn history of ruins, as well as its lurking dangers. Its “B” counterpart is also wonderful with its quieter treatment of the same, vast and isolating with its distant choir and underlying ambience. “Old Capital” is more overt with Middle Eastern influence, from the central melodies to the seductive percussion. Its “B” version sounds more typically Sakimoto in orchestral sound, and it’s neat to see how its melody fits in to Sakimoto’s usual harmonizations here. “Forgotten Sanctuary” is a very effective track which begins very sparsely but then builds up the percussion to a frenzy, with a great use of buzzing and echoing throughout. The “B” version of “Wallace’s Underground Labyrinth” is similarly great with strong percussion work, complemented here by a bubbling synth and some edgier electronica influences. There’s barely anything going on melodically, but Sakimoto crafts the atmosphere masterfully. “Lost Woods” is a great mix of classical Sakimoto with the underlying harp and strings mixed with the newer sound he touts here on the flute. The alternate instrumentation on the “B” version is also great, being more quirky and odd. These tracks and the other stage themes are all strong, varied works that are evocative and engaging. The other area themes are written for the various locales in the city. Although some sound rather typical for the fantasy setting like “City Street”, “Adventurer’s Guild”, or “Castle”, they’re serviceable and carry the older Sakimoto flair. “Morgan’s Magic Item Shop” and “Lucain’s Tower” are on the other side of the coin being more Middle Eastern. The former especially feels so with a hazy atmosphere, though it’s not as grabbing as its short melody simply floats by rather than taking hold, and the latter also isn’t very interesting outside of its exotic sound. Others are more interesting or memorable, like “Dragon’s Haven Inn”, which has a surprisingly heavy sound for an inn theme. Rather than a restful ambience, the track seems more to anticipate the player’s next move, with elements like the parallel intervals and the thunderous descending bass just waiting to resolve and take off. One of the major themes of the game, “World Map” features ethereal vocalist Eumyth against a sparse but grand backdrop, with a beautiful melody to match. “Canaan Temple” is a wistful track with a mourning solo wind instrument also over another sparse but this time much quieter backdrop, feeling more sombre. 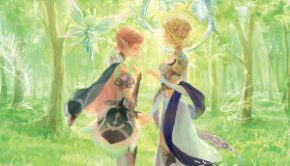 These two stand out especially because they offer some of the calmest moments in the busy soundtrack, and are welcome and appreciated. 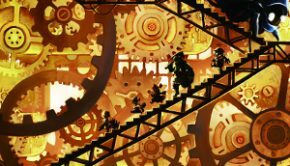 Other tracks are various event themes or other recurring themes that can happen within the stages or as part of story scenes. A good number of these are quieter tracks, expanding the range of atmospheres on the soundtrack while staying within the bounds of the established sound, but unfortunately they are a bit weaker. “Encounters” is an orchestral version of “World Map”, losing some of the original’s magic but otherwise acceptable. “The Quiet Residence” and “Shadow of the Throne” are a bit similar in instrumentation but more ominous, though neither come off as particularly special. “Full of Sorrow” is strings heavy and follows its title, but it’s one of the few tracks where Sakimoto’s sound library fails him; it would have worked much better with a real orchestra, or at least a real solo violin. “A Moment of Rest” and “Mystery and Sadness” both also would have benefitted from this, but they are pleasant enough as they are. “The Labyrinth Hideout” has an interesting riff used throughout, but sadly not enough is actually done to riff off of it, so it sort of comes off as annoying. Not all is lost here though; “Memories to be Told” is a moving and brooding guitar piece and is one of the soundtrack highlights, as is “Returning Home” with a lovely floating improvisation over an accompaniment that almost literally breathes calmness and warmth. The other event themes are more rousing, most avoiding the Middle Eastern influence. “The Beginning of the Trial” is a strong early track that is relentless throughout, heavy on percussion as well as both on orchestral and choral elements. Noteworthy are the choral harmonies in the later section of the track, which follow some unexpected shifts that come together really well. “Fighting Off the Fierce Attacks” and “Variant Eyes” are both very strong rhythmically, which bolsters the impact of the pieces and helps the melodies stick better. Many of the others like “An Appearance of Evil” or “Those that Threaten Life” don’t do quite enough to distinguish themselves, but they all reflect Sakimoto’s venture into heavier percussion alongside his staple orchestral elements. The final battle track “Looking for the Ancient Crown” is another album highlight, reprising the major themes and packing with it a strong punch. It is also carries some shades of his older works, but with a lot else going on it all sums up as a winning combination. Then there is the closing “Ending Theme”, which begins with a charming segment before moving into “World Map” (mostly unchanged), and then a closing last hurrah from the battlefield. Each segment is distinct and so it doesn’t exactly come together cohesively, but otherwise it is enjoyable. Included as bonuses on the album are two piano solo arrangements written by Azusa Chiba and performed by Yutaka Kanai. “City Street” is a fairly straightforward arrangement of the theme, though the performance is notably more dynamic than the original, going from very soft to surprisingly forceful at some moments. Even though the arrangement is mostly predictable, as with other piano arrangements of Sakimoto’s work it is still a big change simply going from the orchestral sound to the solo piano, bringing out here the melody and Sakimoto’s harmonic basis for the track. “World Map” is the other arrangement, fleshing the track’s accompaniment out much more, starting off with a light mood and steady flow then finishing off in a very dramatic fashion with many quick runs. I wish a bit more was done to develop the themes, but the arrangements are still both are fine companions to the original tracks, and I would not mind a Dragon’s Crown piano arrangement by the pair. Hitoshi Sakimoto has crafted another wonderful score in Dragon’s Crown Original Soundtrack, combining his usual rich output with some new Middle Eastern sounds and instruments for a fresher experience. Admittedly some of the tracks don’t manage to stand out much, being too homogenous with others or a bit shallow in composition, and there were also many times when I longed for a real orchestra. However, there are many great moments on the soundtrack, particularly in the excellent stage themes which are varied and effective with many things going on in them. As is usual for Sakimoto, the soundtrack is short on hummable themes, but it is certainly still enjoyable to listen to, and for me it has gotten better with each revisit. Fans either of Sakimoto’s work or of Dragon’s Crown definitely ought to check it out. It’s available in physical edition at various import stores and can also be download through digital music stores. Posted on April 1, 2016 by Christopher Huynh. Last modified on April 1, 2016.